Photo from Wikipedia showing a lithopedion that was 55 years old. Lithopedion, or stone baby syndrome, is an extremely rare condition that happens when a fetus forms in the abdomen rather than in the uterus and dies during pregnancy. If the remains are too large to be absorbed by the body the surrounding amniotic will slowly calcify to protect the woman’s body from an infection caused by decomposing tissue, preventing further complications. Only about 300 cases of lithopedion have ever been documented throughout history. The earliest lithopedion found in the archaeological record was excavated at Bering Sinkhole, in Texas and is believed to be over 3000 years old. The earliest documented lithopedion occurred in 1582 when the body of a 68-year-old French woman, Madame Colombe Chatri, was autopsied and the physician found a fully-developed fetus whose remains had calcified. Chatri’s had been carrying her “stone baby” for 28 years and her abdomen was said to be “swollen, hard and painful throughout her life.” Apparently for good reason! When Chatri’s autopsy findings were published with illustrations, showing her and her mummified fetus, it became a medical bestseller. The calcified fetus was sold and changed hand several times. It went on display at a museum of curiosities in Paris, showed at the King of Denmark’s royal museum in 1653, and was moved to the Danish Museum of Natural History before it disappeared. In 2009 Huang Yijun, a 92-year-old woman living in southern China, finally delivered a child she had been been carrying for over 50 years. The fetus died in 1948, but she didn’t have it removed because she didn’t have the money. In December 2013 an 82-year-old Colombian woman went to the doctor for pelvic discomfort and was shocked to find that her pain was caused by 40-year-old lithopedion weighing 4lbs. Her doctors discovered “stone baby” only after it was revealed by an X-ray. At the time of the article the elderly woman was expected to undergo surgery to remove it. 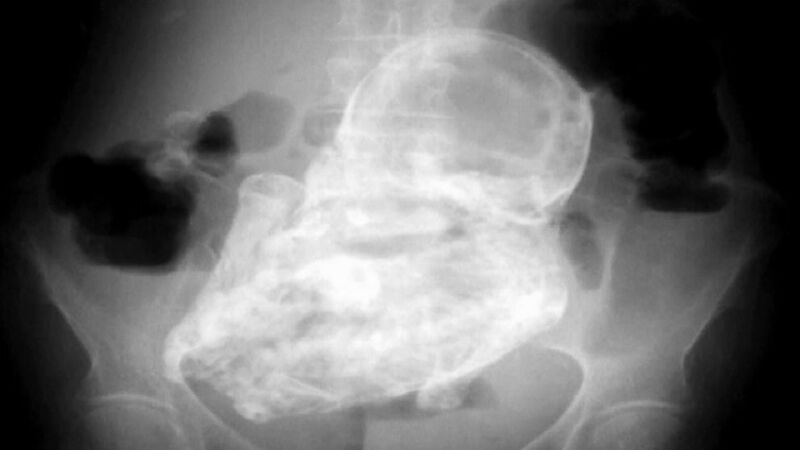 X-ray of 40 year old fetus discovered in Colombian woman in December of 2013. Odd Bones – Stylish deformities: The ways that fashion has flattened, bent, and broken bones. Odd Bones: The rare genetic mutation that caused the bones of the “Irish Giant” to grow and grow. I saw a documentary about this a couple of years ago. One of the most fascinating programs I have ever watched. Actually, kind of sad too. It can’t be easy for these woman if they know what’s happening. Quite the clever title. It is truly amazing what the human body will endure. That reminds me of a scene of Peter Brook’s movie on the Mahabharata: the queen was pregnant for many years, creating political tensions, and finally delivered a massive ball of rock-solid flesh… I think the ball is then cut into pieces to make seeds for real children; unfortunatly, i can’t find any reference neither to the movie nor the original poem.